BJP National President Shri Amit Shah kicked off the party’s campaign in West Bengal for the 2019 Lok Sabha elections with a mega rally in Malda on 22 January, 2018. 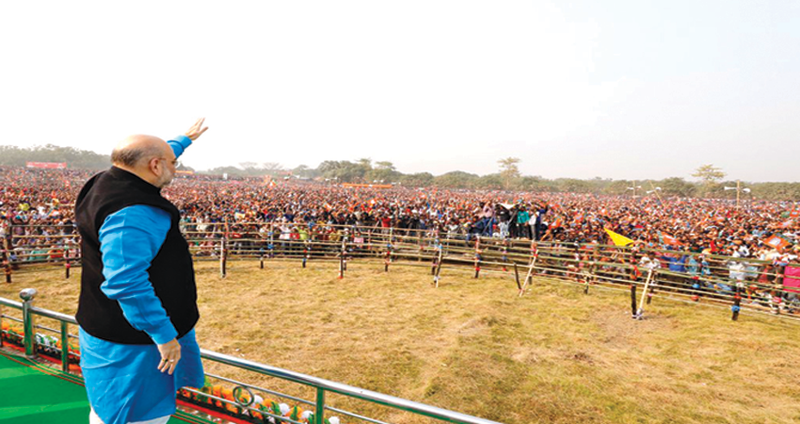 Addressing the massive public rally at Habibpur in Malda Shri Amit Shah tore into the Trinamool Congress (TMC) for forging an alliance with other parties and running alleged scams and syndicate Raj in the state. He also lambasted the Mamata Banerjee government for not allowing BJP’s Rath Yatra in Bengal and not giving permission to land his chopper. He also hit out at TMC over Saradha, Narada and Rose Valley scams and said half of the central government funds for her government is amassed by Banerjee’s party leaders. “Another half of the money is amassed by infiltrators. If we come to power in Bengal then we will not allow infiltration in Bengal. She keeps mum as they are her party’s vote bank,” he said. Shifting his focus to TMC’s United India rally in Kolkata where 25 Opposition leaders forged a grand alliance against the BJP-led NDA government, Shri Shah described it as a selfish alliance. “What kind of alliance is this? Their agenda is clear. They want to remove Modi. Our agenda is clear. We want to remove poverty and unemployment. Mamata Banerjee cannot remove Modi by holding hands with four to five leaders. This alliance will not work as they want a majboor (helpless) government but we want a majboot (strong) government,” he said. “What is this gathbandhan? It’s about power and self-interest. They didn’t chant Vande Materam and Bharat Mata Ki Jai in Opposition’s Kolkata rally” he said. “Prime Minister Shri Narendra Modi led Central government has offered 129 welfare schemes for the people of the country. But Mamata Didi is not allowing the benefits to reach to the people of the state,” Shri Amit Shah speaking to the people in the rally said. He said the Central money is consumed half by infiltrators and the rest half by TMC leaders. He said Narendra Modi-led government gave Rs 3.95 lakh cr to Bengal where as the UPA Govt gave only Rs 1.32 lakh cr in 5 years to Bengal. The BJP National President said, “The administration here has been politicized. There was no permission for my helicopter and for the BJP Rath Yatra”. Shri Amit Shah further said, “We have to start factories in Bengal and shut down illegal arms and bomb manufacturing units” which have grown many folds under TMC rule in West Bengal. Assuring the huge gathering in Malda, BJP National President said, “Throw out the Mamata Banerjee led TMC government from West Bengal and I assure you that no one will have to pay syndicate tax in future”. “The Bengal government employees get 49% less DA than their Central government counterparts. Where has the money gone,” asks Shri Shah. 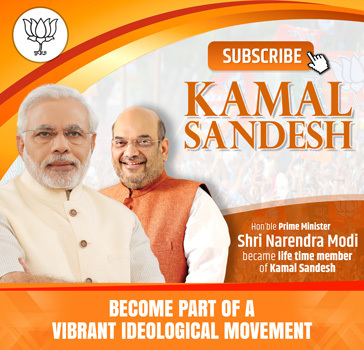 BJP National President Shri Amit Shah said, “Vote for BJP in West Bengal and not a single cow will be smuggled”. Shri Amit Shah said, “I want to ask Mamata Banerjee, the refugees who have come from Bangladesh are asking you, whether you will support the Citizenship Amendment Bill or not”. Shri Shah further assured that, “I am assuring Hindu, Buddhist and Sikh people living here need not fear NRC”. “TMC has turned Bengal into a kangal state,” says Shri Shah while interacting with the people. He said, “In TMC’s regime, every 5th person in Bengal is living below poverty line”. Shri Amit Shah in Malda rally said, “You (TMC) did not let people vote in the rural polls. Don’t try it this time. The central election commission will be in charge. Their staff will be in all booths. People need not fear”. “Mamata Banerjee can stop our Yatras, but can’t remove BJP from hearts of people,” said Shri Shah. “You don’t give us permission for the Yatra. It isn’t a big deal. We will work harder, will sweat it out, but will sure dethrone you,” he said. “I have come here to kickstart the election campaign in Bengal. The 2019 Lok Sabha election is more important for Bengal than for the rest of the country. This election is to determine whether this autocratic TMC government will remain or will be thrown away,” Shri Amit Shah said.He said, “2019 polls will also determine Bengal’s future”. Addressing on the occasion West Bengal BJP President Shri Dilip Ghosh said I have already given words to Shri Amit Shah ji that we will win more than 22 seats of Bengal out of 42. “We have given word to our National President that we will win more than 22 seats, including both seats in Malda. And I strongly people in Bengal are so fed off, they will definitely respond positively to us and remove TMC from the State”. Addressing the rally BJP leader Shri Mukul Roy said if TMC crosses 20 Lok Sabha seats in 2019, I will leave politics. He said TMC chief Mamata Banerjee is acting as a roadblock for development schemes. She is opposing a scheme like Ayushman Bharat which is being praised across the world,” said Shri Roy.